This is a lucky Indian charm for the increase of knowledge, education, brain power and benefits from knowledge. This charm worn as an amulet on the body is beneficial for those in the field of education. This Yantra has to be inscribed on gold, on any auspicious occasion. Then it has to be worshipped by offering it milk and jaggary and lighting an oil lamp and incense. This will energize this charm and infuse life into it. Then it should be worn on the body as a locket. 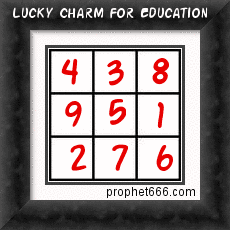 One can chant any mantra of the Goddess of Learning and Education Saraswati; 108 times daily. can we use any yellow colour cloth instead of gold. sir please bataye? kya hum paper ya cloth ka use kr sakte hai gold ki jagah? you can try to make the yantra on paper with ashtagandha or sandalwood paste. ok thanks sandalwood paste jo hum face pe pack lagate hai. woh use kar skte ha kya. ya koi alag paste hoti h? Can I keep it in my daughter school bag? Yes, it can be kept in the school bag.